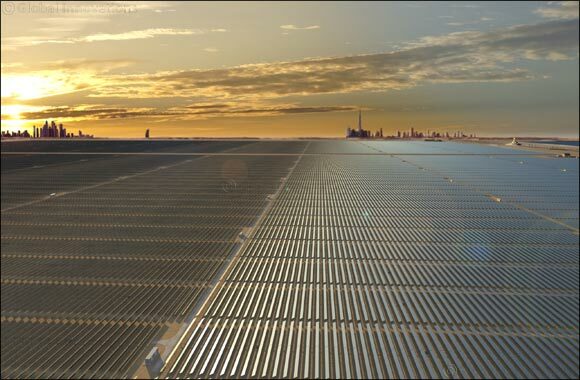 Dubai, UAE, October 17, 2018: The third phase of the Mohammed bin Rashid Al Maktoum (MBR) Solar Park in Dubai has been awarded Solar Project of the Year 2018 at the Asian Power Awards in Jakarata. Ian Warrilow, President and Country Manager of Mubadala Petroleum, accepted the award on behalf of Masdar (Abu Dhabi Future Energy Company), a partner in Shua'a Energy 2, the project company developing Phase 3. The shareholders in Shua'a Energy 2 are Dubai Electricity Water and Electricity Authority (60%); Masdar (24%); and EDF Renewables (16%). A Masdar-led consortium set a record-low price for solar power generation when it successfully bid to develop Phase 3 in 2016. The 800-megawatt (MW) project is the largest expansion of the MBR Solar Park undertaken so far. The first 200MW stage was inaugurated in April, while final completion of the remaining 600MW is on track for 2020. “Winning this prestigious award is well deserved and a reflection of the outstanding teamwork demonstrated by all the partners involved in this world-class project, one of the largest ever solar power projects to use single-axis tracker technology to follow the path of sun, and the largest renewables project in the MENA region to receive Sharia-compliant financing,” said Fawaz Al Muharrami, Executive Managing Director of Shua'a Energy 2. On completion in 2030, the AED50 billion MBR Solar Park will have a total capacity of 5,000MW, which will make a significant contribution towards achieving the Dubai Clean Energy Strategy 2050 and the UAE goal of generating 27% of its power needs from clean energy sources by 2021. It is the largest single-site solar park in the world based on the independent power producer (IPP) model. Masdar's Clean Energy division is a leading developer and operator of utility-scale renewable energy projects; applications providing energy access to communities away from the electricity grid; and energy services consultancy. Active in more 20 countries, Masdar has renewable energy projects in the UAE, Jordan, Mauritania, Egypt, Morocco, the UK, Serbia, Montenegro and Spain. Phase 3 of the MBR Solar Park is one a number of innovative and commercial renewable energy projects that Masdar will be displaying on its purpose-built stand throughout the Water, Energy, Technology and Environment exhibition (WETEX), organized by DEWA in Dubai from October 23-25. Masdar thought leaders will also be participating in the concurrent Dubai Solar Show and WETEX Technical Sessions, speaking on a diversity of topics including Saudi Arabia's renewable energy ambitions (Oct 23); the growth of the clean energy sector in Jordan (Oct 23); waste to energy (Oct 23); intelligent mobility (Oct 25); and smart cities (Oct 25). Dubbed “The Oscars of the power industry”, the Asian Power Awards, now in its 14th year, recognizes ground-breaking projects and trailblazing initiatives in the power sector in Asia.